Animals, People for the Ethical Treatment of – After several exotic animals were released (and many of them killed) from a private zoo in Ohio, PETA has asked director Cameron Crowe to issue warnings in promo materials for his upcoming We Bought A Zoo: “We Bought a Zoo conveys the misleading and downright dangerous message that no special knowledge–just a lot of heart–is needed to run a zoo.” PETA has obviously not seen many movies, or it would know that “a lot of heart” is all that is necessary to play football at Notre Dame, defeat larger and more skilled boxers/cage-fighters/karate masters, and lead a scrappy band of rebels to victory against numerically and technologically superior invading alien forces. Probably the least fake "person" you'll encounter at the Macy's Thanksgiving Day Parade. 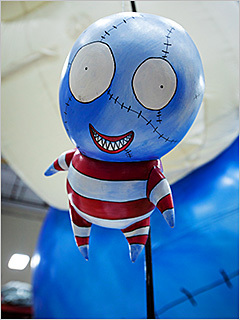 Burton, Tim – The über-outre director will have a balloon named B. Boy in this year’s Macy’s Thanksgiving Day Parade. Never one to skimp on back-story, Burton says that B. Boy was sewn together from the remains of balloons used in parties at a children’s hospital in London. Given the crowd that usually participates in the Parade, B. Boy will probably be the least stitched-together, plastic person there. Carey, Mariah – People recently headlined that Mariah Carey’s twins would be making their TV debut. Exciting, until you realize it was about the actual twin human beings she birthed about six months ago. Kardashian, Kim – The media-est Kardashian will appear in Tyler Perry’s The Marriage Counselor as Ava, co-worker to main character Judith, “who gives Judith a big city makeover and new confidence as she struggles with her personal issues.” In other words, Perry just filmed an episode of Kourtney & Kim Take New York. ‘Pocalypse, The – As far as we know, the world didn’t end again last Friday. That means that Two and A Half Men still lives. Maybe we should have been rooting for Harold Camping to be right. Reynolds, Ryan – The Green Lantern actor spent his 35th birthday with Sandra Bullock and Blake Lively at NYC burlesque club The Box. One performance featured a “suicidal pregnant prom queen devouring her young.” This may also have been an audition for the new season of Teen Mom.